Discuss the FN Five-seveN line of pistols and accessories. It looks like I will go with Bravo Concealment Kydex, I plan on making my own belt interface out of heavy horsehide and go with a Small of the Back carry. I believe that that is the best location for concealing a large handgun. Have you looked at our Holsters? That's what I am here for. We can't keep them in stock. Lisa moved some tings around and it somehow got dropped. I asked Lisa to get it back up ASAP. 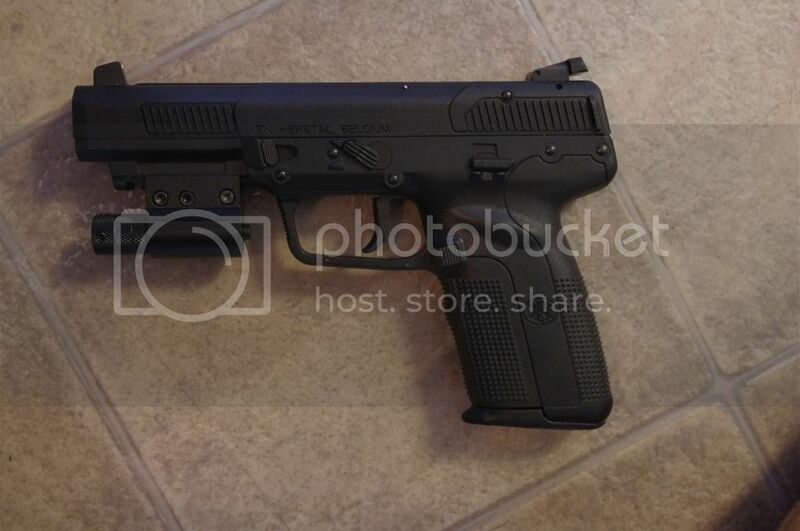 Need a kydex RH paddle holster for a FN FiveseveN MK2. Any recommendations? 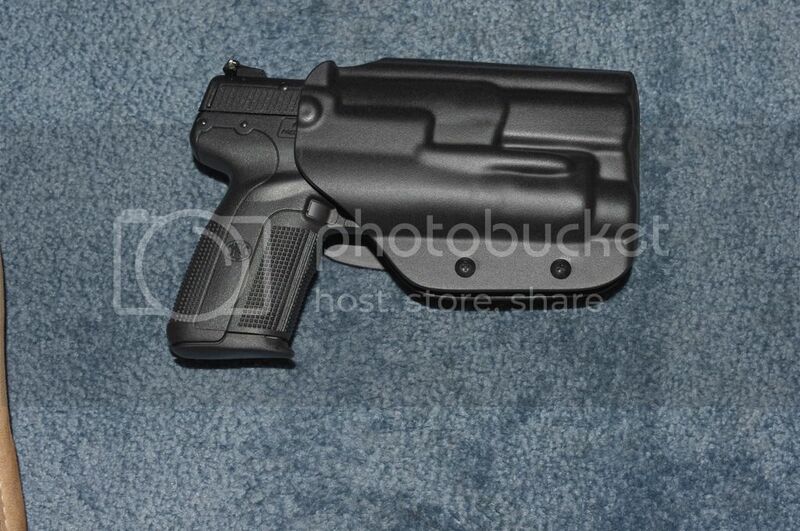 bill2740 wrote: Need a kydex RH paddle holster for a FN FiveseveN MK2. Any recommendations? Call Kee at RMHolsters.com He made me one that is outstanding. Re: Holster sources for FNH MK-II 5.7, with Laser Sight. My Laser sight setup is sorta a "swoose", made up from the base mounting plate from a Ultimate Arms Gear Tactical Compact Red Laser Sight Item No. ''UAG-RLS-KLDG-1-SW'', with the the laser tube from a VERY100 Tactical Red Laser Dot Sight Scope with Mount For Gun Rifle Pistol. I originally mounted the UA laser on the rail, but found that the switch unit of the laser tube only worked intermittently, and was clumsy to operate, so when I got the V-100 unit, I liked he push button switch on the unit, but decided to only use the laser tube, since I liked the larger, more stable, mounting block on the UA unit, and luckily the tube from the V-100 interchanged into it very well. After many inquiries, all Negative, I just bought a BladeTech Holster, designed to fit the older FNH 5,7 pistol (OWB w/TL FNH Five seveN USG - RH - BLK, Style : X0009HOLX000935776137), and it fits my newer FNH MK-II 5.7 pistol, with the Laser sight, just fine, as is too. Since the only difference between the two models of FNH 5.7 is supposed to be in the design of the front of the trigger guard, this holster should fit all the newer MK-IIs too, with, or without, a Tactical light, or a Laser sight, on them. Another Holster, a BLACKHAWK! 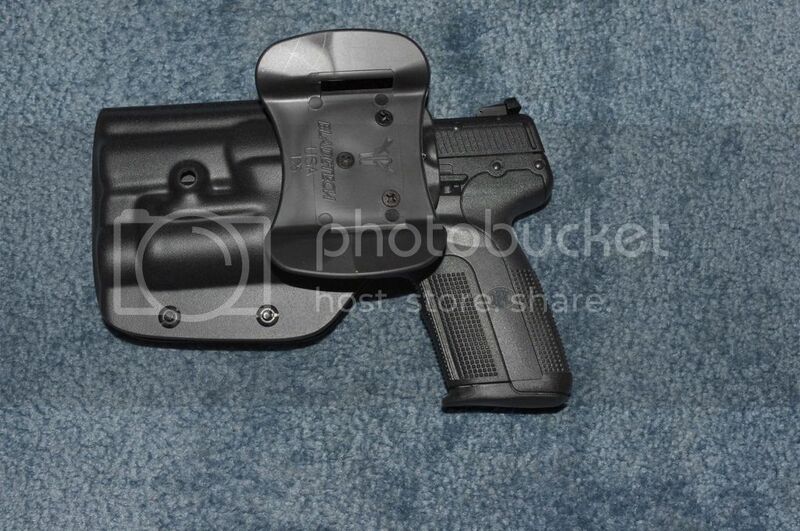 Nylon Laser Holster, Size 03, (1911 Govt' with most under barrel lasers) also fit my FNH 5.7 w/ Laser sight too, however the bottom, rear opening of the Holster will have to be opened up, a little, then re-sewed in order for Laser unit of have clearance, which may also have an effect on the adjustment of the Lasers aim as well. Nylon BlackHawk pancake covers my stash of guns without changing holster. Size six seems to be universal size for me from my Walther PPK to Fn5/7. The FNX tactical 45 pushes that size though. Love this holster. Not only cheap but I'd compare it to KelTec arms. It just works. Try it you'll never turn back. just ordered one per your recommendation. will report on how it is. How did you like your Bravo Concealment? They seem like great holsters. What I finally got for my FSN Fiveseven, was "Blade Tech" holster, molded for a rail mount light, but it also fit my laser sight as well. Figured it should fit my MK-II, even if I have to use my Dremel Tool to enlarge the front of the trigger guard area, which is the only difference that I know of, between mine, and the earlier model FNH Five-seveN pistol? I've got an awesome leather holster from Kramer Leather for my FN 5.7. It is an MSP Paddle and I've had it for years - it's superb. Add https://www.blackarchholsters.com/ to this list as well. Just bought one so don't have a review, but you can find them on youtube. I noticed the DSG Alpha holsters were on sale. I know there is a lot of excellent choices out there but DSG Alpha is a favorite of mine. I was surprised to see they offered one for the 5.7. Try https://www.craftholsters.com/ they make custom Kydex, leather, nylon or polymer holsters for FN.